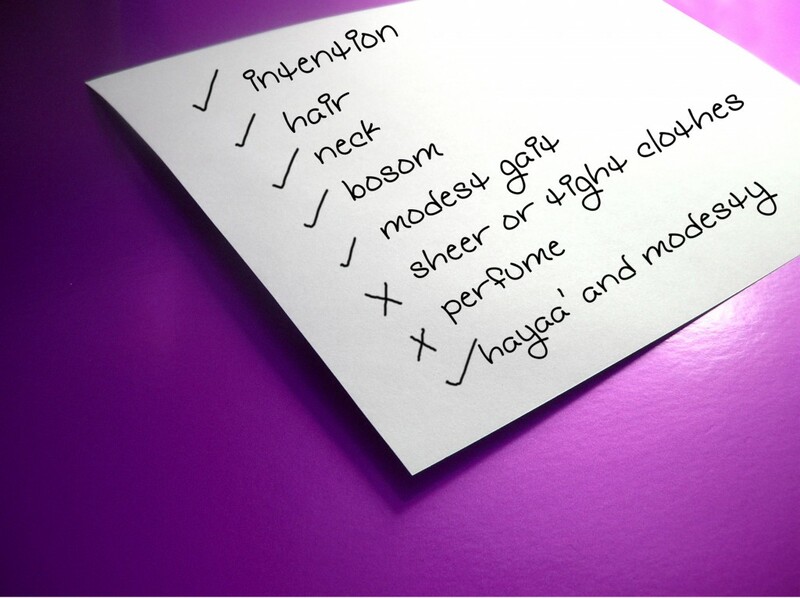 A beneficial checklist, and reminders for every woman in hijab. Hijaab is not a piece of cloth on your head. Just because some of the sisters have their head covered, they think that the requirement of Hijaab is fulfilled. They don’t realize that wearing a Hijaab requires much more than just covering your head. Actually, if you think about it, Hijaab is the way you talk…the way you walk…the very way you carry yourself. “And say to the believing women to lower their gazes, and to guard their private parts, and not to display their beauty (zeenah) except what is apparent of it, and to extend their head coverings (khimars) to cover their bosoms (jaybs), and not to display their beauty except to their husbands, or their fathers, or their husband’s fathers, or their sons, or their husband’s sons, or their brothers, or their brothers’ sons, or their sisters’ sons, or their womenfolk, or what their right hands rule (slaves), or the followers from the men who do not feel sexual desire, or the small children to whom the nakedness of women is not apparent, and not to strike their feet (on the ground) so as to make known what they hide of their adornments. And turn in repentance to Allah together, O you believers, in order that you are successful.” (Surat-un-Nur: 31). Here are some of the more common issues in light of this verse about the Hijaab. Well, my head is covered. What more do you want? If you look carefully at the ayah, it clearly states that the head covers (khumur) should be drawn over the neck slits (juyoob). Khumur is the plural of the Arabic word “khimar” which means a head cover. Juyoob is the plural of the Arabic word “jaiyb,” which refers to the neck slit (of the dress). Yet, some sisters just cover their head with something, and think they are fulfilling the rights of Hijaab, although part of their hair or body is showing, or their whole neck and chest area are exposed. Actually, that was the way of the women of Jahilliyah. So secure the scarf well around your face, covering your neck/chest area, and keep those half sleeves and capri pants for your Mahrams. You can’t wear tight jeans and a short shirt with a piece of cloth on your head and think this is Hijaab. Nor can you wear anything else that is tight, describing the shape of the body in any way, even if it is long. You CANNOT use chiffon or other see through material to cover your hair and body. Everything should be covered and the color of the skin [and hair] underneath should not be visible. (The word gholalah in Arabic means a thick fabric worn under the dress to prevent it from describing the shape of the body). The dress should not be such that it attracts men’s attention to the woman’s beauty. Allaah clearly states “not to display their beauty (zeenah).” Yet, Subhaan Allaah, some Hijaabi sisters are dressed in such a way that they attract more attention to themselves than they would if they didn’t wear Hijaab!! 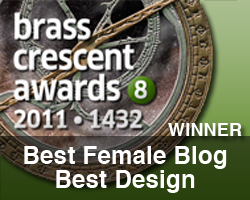 How could such zeenah be concealed if the dress is designed in a way that it attracts men’s eyes to the woman? It beats the purpose of Hijaab. What about make-up and perfume??? Wearing make up is also part of the zeenah that Allaah orders us NOT to display. So if your head and body are appropriately covered yet you are wearing bright red lipstick or dark eyeliner such that people confuse between you and a raccoon… uh sorry, that’s not Hijaab. And keep those nice fragrances for the home, between you and your husband. That’s part of Hijaab too, even if you are going to the Masjid. Tinkling Jewelry and Jingling Bracelets – ‘Loud’ and tinkling anything, be it jewelry, bracelets, clip-clopping shoes, little bells on clothes, you name it – if it jingles or makes noise, it is against the principles of Hijaab, because it attracts attention to the one wearing it. Some sisters assume that since they are properly covered, its okay for them to sit around and talk, laugh, joke, etc. with the men, but that’s not right, even if he is ‘the Shaikh’. So talk to them when there is a specific need, and in a manner that is not necessarily rude, yet it is polite but firm. There is no such thing as “we’re just friends.” Talking to non-Mahrams is wrong even if it is through the internet or telephone. There are too many stories of illegal relationships, fornication, broken homes, extra-marital affairs and runaway brides to even mention. That is why in Islam anything that leads to haraam is also haraam. Remember, you are not a runway model displaying the latest fashion. Walk with modesty and hayaa and you will be respected. The Prophet (Sal Allaahu Alaiyhi wa Sallam) said: “There are two types of the people of Hell that I have not seen yet… women who are clothed yet naked, walking with an enticing gait…” (Muslim). Don’t shake hands with non-Mahrams. Its part of Hijaab. It is not permissible to shake hands with a non-Mahram, because the Prophet (Sal Allaahu Alaiyhi wa Sallam) said: “For one of you to be stabbed in the head with an iron needle is better for him than to touch a woman who is not permissible for him.” (at-Tabaraani saheeh by al-Albaani). And no, it is not rude to refuse to shake hands with non-Muslims. Simply politely explain that its part of your religion and they are very understanding. I see many sisters entering the Masjid from the men’s entrance, or standing idle in the hallways or where there is a chance of unnecessary mixing with the brothers. What for? Don’t we have a separate entrance for ourselves? Why do you think Allaah ordained the Hijaab in the first place? To avoid fitnah, by reducing temptation and separating the genders. Although some sisters wear the Hijaab themselves, they forget that they cannot talk about another sister and her beauty in front of their own husbands, brothers, etc. Remember, part of your Hijaab is to cover your sister’s ‘awrah’ as well. May Allah guide us and bless us with the TRUE understanding of His Deen. Ameen. Please note: As with most of our “Internet Finds,” we are not in touch with the writers, and copyrights belong to their respective sources. Mashallah these comforting words of Allah are amazing, sisters you shouid all be following this because it is protection and pleases Allah the greatest, lets hope they all as we are all being judged. May Allah help and always guide the person who posted this Hijab article and all the Muslims. Thank you so much for this, I am working on becoming a hijabi, In Sha Allah, and these things are so helpful and insightful to work towards becoming the most of who I can be. Do you want episode free passes episodefreepasses.website.